What Are the Best Lip Colors for Women with Black Skin? Dark skin is very beautiful. You can emphasize its beauty by using the correct color of lipstick. Here we'll look at the question of what lip colors best suit women with dark skin. Dark skin is very beautiful. So if you have just returned from the seaside, where you were basking in the hot sun, or if you love to visit a solarium, pearl lipstick will ideally accentuate your tan. Pearl lipstick and lip gloss are all harmoniously combined with dark skin, emphasizing its natural color. Also, a coral lipstick is perfect for tanned skin. And a bold orange lipstick creates an interesting effect as well. As for bright colors, everything is strictly individual. On one hand, they are able to emphasize the chocolate tan, which is so valued in our areas where sunny days are rare. On the other hand, too bright a lipstick will look unnatural on tanned skin. So use light shades of lipstick carefully. If you are well-tanned or if you have naturally dark skin, stick to bright and juicy shades of lipstick. In general, almost any bright shade will suit you, but you should avoid brown and purple colors. Lips coated with brown lipstick will merge with dark skin. It's strange, but a purple color makes tanned or dark skin look unpleasantly yellowish. At the same time, when choosing bright lipstick, do not overdo your eye makeup. You should already know that the focus is reserved for only one feature, either the eyes or the lips. This rule has not been canceled. Use bland, semi-transparent, almost invisible eye shadows of natural colors. Next, apply a little makeup on your eyelashes and eyebrows. Let your lips be in the spotlight, attracting admiring glances! What Are Beautiful Lipstick Color for Black Women? What Are the Best Lip Colors for Women with Dark Skin? 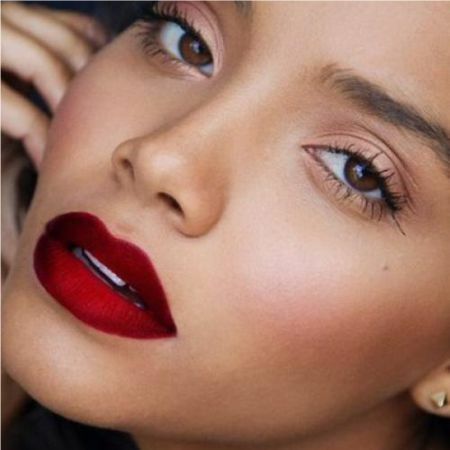 If you just remember what color lipstick is the best for women with dark skin, you will be able to achieve great results and conquer all with your beauty. You can be different: mysterious and enigmatic, fatal and irresistible, a bright exotic flower, or an elusive night shadow. Create different images; don't be afraid to experiment and try new colors. Dark skin gives you virtually unlimited opportunities for creativity and the manifestation of your own "self." All you need is a tube of lipstick, a lip pencil, and the appropriate mood. Like the article «What Are the Best Lip Colors for Women with Black Skin?»? Share it with friends!